A recent encounter on Twitter with a bunch of climate change denial types sent my memory flying back nearly 20 years to my days as a reporter and an eerily parallel run-in. Now as then, I realized, we’re face-to-face with a suicide cult. Climate change threatens us all, of course, but it’s of special concern here at The Greenlining Institute because low-income communities of color have the fewest resources to deal with its effects and often suffer most from the toxic air pollution generated by our fossil fuel economy. In addition, these communities most urgently need the jobs and investment that the clean energy economy will bring – or at least can bring if governments design policies to give disadvantaged communities a fair share of these investments. For all these reasons – not to mention that whole survival-of-civilization thing — climate change denial poses a serious threat. Someone had tweeted a scary image of smoke from the Woolsey Fire billowing over Pacific Coast Highway near Malibu. I retweeted the image and added a few thoughts of my own. 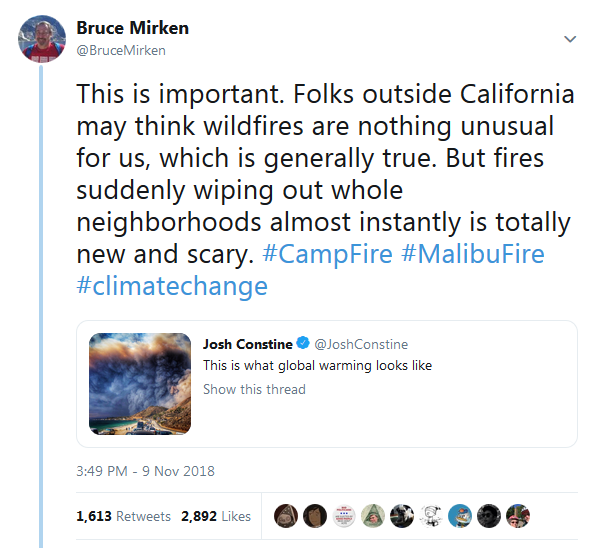 I noted that we’ve always had fires in California, but the number of these high-intensity firestorms – and seeing them in November, no less – represents a new and frightening development. And that’s what sent the memories flooding back: the intensity with which these folks deflected all contradictory facts, stuck to their talking points and defended their belief system to the point of denying obvious reality. I’d been there before. Starting in the late 1990s I became interested in the cult-like network of people, known as AIDS denialists, who insisted that HIV doesn’t really cause AIDS, that AIDS isn’t even a real disease, and that the entire epidemic is a fiction generated by funding-hungry government researchers and profit-crazed drug companies. They told people with HIV to shun the medicines their doctors prescribed – “poisons” in their view – and advised that people could stay healthy if they just lived a healthy life and avoided all drugs, recreational and pharmaceutical. I’ll spare you the details, but as I sifted through the research it became obvious that these claims were nonsense, cobbled together from denial, disinformation and obvious lies. I ended up writing a number of articles, including a series for AIDS Treatment News debunking the denialist arguments point by point. That’s when the suicide cult got mad. All four – ranging in age from late 30s to about 50 – died from “mysterious” infections that they went to their graves believing could not possibly be related to that “harmless passenger virus” called HIV. Even though effective anti-HIV drug combinations were in wide and successful use by the time their health began to crash, belief in their suicide cult won out over willingness to even consider the possibility that their belief system was mistaken. Of course, these people didn’t know they were in a suicide cult. Like all cultists, they’d learned to shut out any information that contradicted their beliefs — so thoroughly that they couldn’t hear the messages their failing bodies were frantically trying to send them. My recent exchanges with the climate change denial cult feel eerily similar. They don’t have facts; they have sound bites and rhetorical tricks that they put up like a Berlin Wall to shut out contradictory information. When all else fails, they crank up the volume and ratchet up the ridicule. Of course, there’s one big difference: The HIV deniers’ suicide cult couldn’t hurt anyone but themselves and the few unfortunate souls they managed to convince with their propaganda. But the climate isn’t like personal health decisions. We can’t address this crisis unless the world’s governments choose to act, and if the climate change denial crowd manages to stop them, we’re all in trouble. And right now, this particular suicide cult runs the U. S. government. Bruce Mirken is Greenlining’s Media Relations Director. Follow him on Twitter.